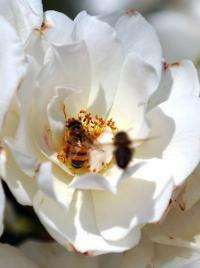 Bees gather pollen in a rose in Los Angeles, California, in 2009. The decline in the US bee population, first observed in 2006, is continuing, a phenomenon that still baffles researchers and beekeepers. The decline in the US bee population, first observed in 2006, is continuing, a phenomenon that still baffles researchers and beekeepers. Scientists call the phenomenon "colony collapse disorder" that has led to the disappearance of millions of adult bees and beehives and occurred elsewhere in the world including in Europe. Researchers have looked at viruses, parasites, insecticides, malnutrition and other environmental factors but have been unable to pinpoint a specific cause for the population decline. "There are a lot of beekeepers who are in trouble" he said. "Under normal condition you have 10 percent winter losses.. this year there are 30, 40 to 50 percent losses." "I don't put my bees in Florida because the last couple of years there has been tremendous increase in pesticide use in the orange crop to fight a disease," he said. "It's a bacterium and the only way to control this disease is to use pesticide... a few years ago they did not use any pesticide at all." He said that pesticide use "has changed dramatically" and has made beekeeping "more challenging." Research conducted in 23 US states and Canada and published in the Public Library of Science journal found 121 different pesticides in 887 samples of bees, wax, pollen and other elements of hives, lending credence to the notion of pesticides as a key problem. Ironically, he said the problem stems from expansion of agriculture to feed the world. But in destroying bee populations, that can hurt crop production. "The world population growth is in a sense the reason for pollinators' decline," he said. Probing Question: What's killing the honey bees? Maybe take a look at a correlation with the use of gene-altered crops? If you augment the amount of pest resistance that those crops exhibit then don't be surprised if the poisons mount up in those insects that feed on them. Simply a natural reaction to over population. Too many bees. Too many humans. Too many minke whales. Too many cars. Too many everything. As the Holocene ends, the natural die off will enable the earth to adjust, once again. Actually, in order for the GMO to be toxic to the target pest, it has to have the actual toxin in each cell, not just the gene for it. It is not the gene that is toxic; it is the compound that the gene causes to be produced by the cell that is toxic. Without the actual toxin, wouldn't there be no pest control? IMHO, this is the most plausible explanation for the bee population decline, as bees collect pollen of all kinds and feed it to their young. If the pollen is toxic, the bee larvae will die. I'm sure Monsanto could care less, however. I would think that gene altered crops would be a part of the problem -- particularly crops like bt corn which contain a pesticide in every cell, including the pollen. Don't confuse pesticides with tannin based resistance mechanisms. Observe colony of bees in a natural environment and those in 'questionable' environments; Do they decline in one or the other or both? We already tag animals in the wild with GPS collars, etc, let's figure something out for the little guys so we can get more evidence and stop guessing. Some controlled studies on bee environments and their population should give some very clear and overall direction, and if bees are naturally dieing off then we can get the pros in there studying the colonies more in depth. This seems like the most obvious idea and direction to take, is there a good reason why I'm wrong? I'm confused as to why half the problems we have exist as problems at all. I was talking with a buddy of mine and happened upon this bee topic. He said "you should see the amount of dead and dieing bees I see all day long". Then it clicked, he works as a dish/tower operator and installs networks across America. He continued on describing countless times he's seen healthy bees flock to these dishes and by the end of the day where dead or half way there. He said they can't resist the signal from these dishes. I have seen articles and heard research on the effects of frequencies on bees and it made complete sense to me. A highly ominous development. There were already massive declines in US honeybee populations, and, if nothing else, it appears likely that this year's harsh winter in the midwest and east exacerbated the problem. It appears that the most likely culprit is a multiple cause scenario- varroa mite, virus, bacteria, and pesticide overload. Another big factor is that honeybees are like most other organisms- they require a varied diet to meet nutritional requirements. In the wild, they feed on many different blossoms. The main difference with these commercially employed colonies is that they a released into huge monoculture farms, thousands upon thousands of acres of almond, corn, soybean,orange, et c. They only get part of their dietary requirements, and so suffer from the bee equivalent of scurvy, ricketts, beri-beri, et c.
Corn pollen is wind dispersed. "The world population growth is in a sense the reason for pollinators' decline,"
This takes away all credibility from this article. Nice try, but you definitely don't get to light the stogie. You deliberately misread. What was meant is simply that a burgeoning human population creates pressure to produce greater and greater amounts of food, which has lead to the proliferation of massive monoculture farming, which in turn leads to most, if not all, of the factors contributing to the recent decline in honeybee population. Do you fancy yourself as being some kind of agent provocateur, or are you just dim? IMO CCD is linked to the bat "white nose syndrome" (WNS), which is probably manifestation of food allergy (long term rhinitis) as well. Many bat species are significant pollinators like bees) and they have disappeared recently as well. The introduction of GMO into Great Britain in 1998 has caused a statistically significant step in generally increasing rate of food allergy, because GMO import was enabled in food market stepwise in legal act, i.e. not gradually in this particular case. The Cry1A / Cry1Ab proteins are always produced in mixtures in GMO, some of active proteins (Cry1B, Cry3Bb1, Cry9c, EPSPS) in GMO strands aren't completely specific to Lepidopthera and other higher organisms as well and a various neglected toxicity synergies can exist here. With respect to GMO induced allergies, the active proteins Cry1A / Cry1Ab in GMO food are very similar to bacterial toxins, against which the immune systems of living organisms (including human and bees) are programmed. The correct function of immune system is based on correct distinction between healthy and pathogenic proteins. The higher number of foreign proteins is forced to distinguish for example in food, the higher risk of allergic response could be expected. The Bacillus thuringiensis is very close to anthrax pathogens (Bacillus anthracis) - so high risk of coincidence in immune reactions (i.e. allergies) exists here. The low but permanent allergen concentration in food (GMO contaminated pollens at the case of bees) has a sensitization effect, because the correct function of adaptive immune system depends on temporary decrease of allergen concentration in reaction with specific antigen. If such decrease doesn't occur (because the organism remains in permanent contact with GMO contaminated food every day), its immune system continues in production of various another antigens, until their number and concentration in organism isn't so high, they initiate an accidental violent allergic reaction even in contact with proteins and various pollutants, which were harmless so far. After then the positive feedback will be established under development of permanent allergic reaction with nonspecific symptoms. In this way, bees could be gradually allergized by presence of GMO toxins in pollens even in minute concentrations. So, seneca, are you guilty of plagiarism? If I would insert the link to this blog, whole my post would be deleted by thread moderators. Anyway, I appreciate, you know (& remember) the original source....;-) It's really important to maintain intellectual property of original sources - but it violates policy of comments on this server. Original ideas are deleted from there due the lack of referenced source, instead... Original thinking is definitely not, what is preferred & supported in contemporary society from various reasons. Yet I linked to it, and pointed out that you're plagiarizing a source. Are you claiming persecution for your ideas? No, he doesn't understand what "pseudoscience" means and as such when his posts are removed he assumes it's because he included a link to his AWT fanboy site. It's insane to think that any corporation (Monsanto) can produce a toxin (for example, Roundup) that eliminates beetles, grasshoppers, fungus, etc. yet miraculously does not effect bees! Adverse weather always has and will continue to have an effect upon bee populations. Broad acre farming has been around for some time and it could be a contributing factor. Such a factor may take many generations before its influence became noticeable. Genetically Modified crops could follow a similar path and take many generations before the effect became clearly noticeable. Therefore it could be a combination of a number of "things", disease agents included. Identifying the cause could be a difficult and protracted exercise. I'm sure Monsanto could care less, however. Don't be a fool. The amount of Ludditism in this community is astounding! You would be better put to believe, rightly, that Monsanto scientists are trying to determine the cause of this situation and find a solution. Not a case of Ludditism, but a case of recognizing that corporate profits trump any other consideration, including the rights of small farmers, the right of consumers to know what is in their food, etc. Shootist should do some research on what Monsanto has been doing to small farmers who refuse to use their GMO seeds, yet have the unfortunate luck of growing regular crops near the big GMO corporate ones, and see if they are really looking for solutions. The fool is the one who blindly accepts the pollyannish idea that Monsanto has all our best interests at heart. Monsanto scientists are not being paid to be environmentally friendly, they are being paid to produce something that will make more profits for their company, period. This way they can afford to lobby for the government to look the other way and allow them to experiment freely on the world's biosphere. IMHO, if Monsanto is "looking for a solution" it is to avoid a lawsuit, not to save bees.